Shannen Wilson '14 arrived on Monmouth University's campus with a laser-focus on her childhood dream of someday attending dental school. "One of my parents' favorite stories is about when I would put white socks on my hands as gloves and pretend I was their dentist," Shannen said. "Then when I was sixteen I started working at an office near my house and fell in love with the idea of seeing new people and learning new things every day." However, upon meeting that goal after four years, she also finds herself a leader, a mentor, and a world traveler - and in doing so, she has left an indelible mark on the Monmouth community. Shannen is ready to start classes at the Rutgers School of Dental Medicine because, while receiving her bachelor's degree in psychology, she harnessed the expertise of Monmouth's undergraduate advisors to chart an education that would both prepare her for professional school and expose her to the world. She took advantage of Monmouth's small classes, ample opportunities for community service, and an internship that honed her skills. While Shannen says many faculty members influenced her during her time at Monmouth, she credits the advice given to her by her faculty advisors with keeping her on a course for academic success. "As a first-year student, Dr. Dorothy Lobo in the biology department took me under her wing, and although I never had her as a professor, she always went above and beyond to advise me in my pursuit of applying to dental school," Shannen says. "The psychology department has been a huge part in my success at Monmouth. Drs. Lisa Dinella, Gary Lewandowksi, Natalie Ciarocco, Jamie Goodwin, Michele Van Volkhom, and Christine Hatchard have been huge supporters of my goal. "As a psychology student with ambitions to go to dental school, I definitely had my work cut out for me at Monmouth. As a first-year student, I relied heavily on my academic advisor to guide me in scheduling classes that would allow me to finish my psychology degree, graduate with honors, and meet all the requirements for dental school in just four years." Shannen also made strong connections with staff members while on campus. "Although not faculty members, Susan Bennett in Student Life and Corey Inzana in Residential Life have both taught me countless life lessons about how to be confident, grateful, and generous in life." "I wanted to get involved in many things as soon as I got to Monmouth," Shannen says. "I joined the First Year Service Project my first week on campus and stayed with the group my entire time. It is a group that focuses on fighting hunger and homelessness in our local area. I was able to find others that were passionate about helping others through this group, and we became lifelong friends. I was involved with many other groups on campus as well, including New Student Orientation as an orientation leader and as a logistics coordinator. "I worked as a peer learning assistant in a First Year Seminar course for three years. This allowed me to be a liaison between first-year students and a professor throughout each semester. Being involved with the honors mentoring program — first as a mentee, then as a mentor, and finally as a student coordinator — allowed me to appreciate all levels of the program and to connect with the Honors School community. "In my senior year, I was given the opportunity to start a new group called the Monmouth University Street Team (MUST), which was committed to bringing free events to campus to spread positivity and encourage students to think about big ideas." Shannen says she used research opportunities in both Monmouth's psychology and honors programs to bolster her credentials for dental school. Her topic was to study patients with dental anxiety. "The psychology department did a terrific job with the research sequence of classes leading to my thesis, so when it came to developing my own project idea I felt comfortable with my abilities in researching and finding an answer to my own question. 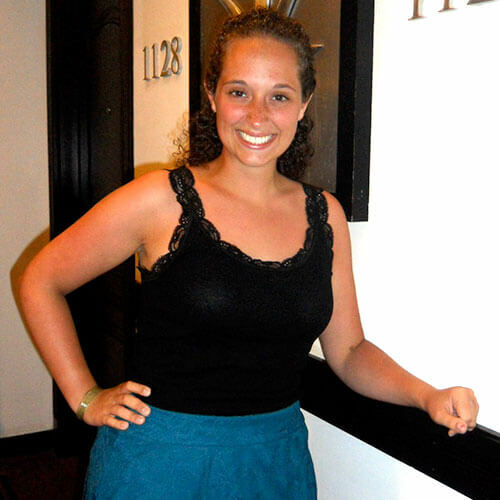 "As an honors student I was required to complete an additional thesis in my senior year. I surveyed patients in a dental office waiting room about their dental anxiety and then had the dentist report on what he perceived the patients' dental anxiety to be to see how congruent the two reports were. "I was privileged to work with Dr. Lisa Dinella from the psychology department on this year-long project. Under her guidance and with the support of the Honors School, I was able to be creative and ambitious and conduct data collection in a local dental office. Being able to conduct a study and present my findings at both the psychology and honors research conferences was a wonderful accomplishment. I grew as a student and researcher throughout both experiences." "From my first day at orientation as a new student I felt connected to Monmouth. All new students are promised grandeur - support, community, and a "home-feel" while at Monmouth - and I am so thankful to say that four years later, all those promises were kept." "Traveling to Guatemala and Haiti on Alternative Spring Break and Alternative Winter Break. "As a sophomore, I was excited and nervous to travel with twenty of my peers and three advisors to work on a construction team building a classroom in Guatemala. After seeing that beautiful country, and meeting and helping those less fortunate, it was a "no-brainer" to apply to go on a similar trip the next year."